My first introduction to crochet designer Kristin Omdahl was her book Wrapped in Crochet: Scarves, Wraps & Shawls. I was so delighted with what I discovered in her first book, that I’ve happily purchased her other books, knowing they are great additions to my crochet book library. Kristin’s latest crochet book, The Finer Edge: Crocheted Trims, Motifs & Borders, joined my personal library in January 2013, and once again, I have not been disappointed by what’s between the covers. The Finer Edge: Crocheted Trims, Motifs & Borders (published by Interweave/F+W Media; $22.95) is a two-fer; not only is it an amazing stitch dictionary featuring four different construction styles for trims and borders, but it also features 10 crochet projects using these trims for accessories, clothing, and home decor. After a short introduction on how to use the book, along with some very helpful information regarding trims and corners, Kristin takes the crocheter through the four construction styles – Top Down, Bottom Up, Side to Side, and Miscellaneous. Each trim pattern has both written and charted directions, plus several of the borders include tips where Kristin shares her knowledge of that particular stitch and inspires the crocheter to look at how the edging can be used in a new light. The last section of the book contains projects, ranging from small projects like the Babylonia hat and the Anni belt/scarf to larger projects like the Palmira Shawl and the Birka car coat. Each project incorporates at least one trim from the earlier section of the book. Because Kristin chose to put both a stitch dictionary and projects within the same book, in my opinion, she has elevated its usefulness for crocheters. Seeing how she used the trims and borders in the projects gives the intermediate and experienced crocheter incentive to try their own experimentation with these patterns, if they so choose. Just as important, beginners will find this book useful. The easiest way to jazz up a simple baby blanket is by adding a trim and this book gives the beginning crocheter several options to choose from. Once that mastery has been gained, this book will encourage the beginner’s crochet skills to grow as they attempt the projects in the back of the book. I think Kristin hit the jackpot with this book, because it truly has something for everyone. 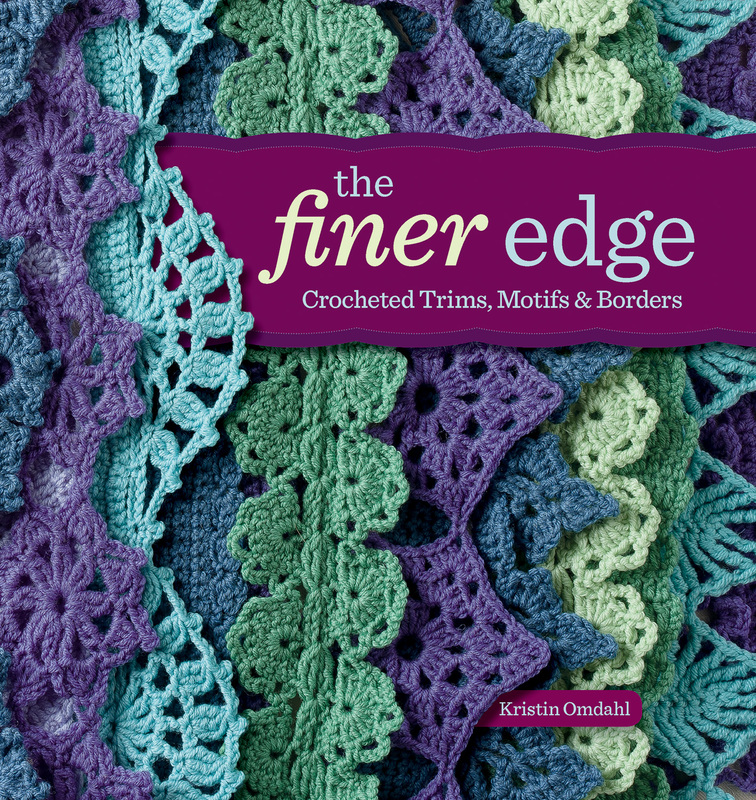 The Finer Edge: Crochet Trims, Motifs & Borders is available for purchase from Interweave http://www.interweavestore.com/the-finer-edge, online retailers such as Barnes & Noble http://www.barnesandnoble.com/w/the-finer-edge-kristin-omdahl/1111430198?ean=9781596685543, and possibly even your local bookstore or yarn store. HOWEVER… you my fine reader are in luck, because the wonderful people at Interweave / F+W Media have made a copy of Kristin’s book available for me to give away. Winner is limited to being a continental, US-based resident (sorry international readers – I’ll work on a future contest just for you). To enter, please leave a comment on this post by 11pm Central on Tuesday, June 25, 2013, including your NAME, your STATE, and which pattern(s) of Kristin’s inspires you as a crocheter. A single winner will be chosen on Wednesday, June 26, 2013 by random number generator and will be contacted. ETA: Contest is closed. Congrats to Pat S. from IL for being the winner. Look for more book reviews to be posted soon. patterns. If I become a great crochet, those are the patterns I would make for myself. I will definitely be checking this book out, I have a good border book too Around The Corner Crochet Borders by Edie Eckman. Great review and terrific book. I need to see this just for the 4 construction style alone! Hi my name is Sharon and I live in Texas – I love the Pompeii Mobius by Kristin – I watched a Knitting Daily show where she demoed the technique and it was a wonderful idea! Hello there! I am Susan M. From Queens, N.Y. I have to say that my next personal crochet project will be the Deerfield Vest in purple. I never wanted to work with metal before, but I think crocheting it is less intimidating. I have made Kristin’s “Diamonds” shawl twice from her Crochet so Fine book which was gifted to me by a friend who knew my love of crochet. One of the shawls was auctioned to raise money for Ovarian Cancer Research, the other was a gift to the friend who gifted me the book. I just love the detail of Kristin’s designs, and how considerate she is with the directions in the patterns. Currently I am working on the Orchid Shawl from the same book. It too will be auctioned for Ovarian Cancer Research. I sure hope I win! I love Kristen and would love to add this book to my library. Your review was very great. I am Ruth from New York. I am a fan of Kristen’s Pompeii Mobius! I am very excited about this book and can’t wait to see it. I have been hearing so much about it! I don’t know that there is one pattern that Kristin has done that inspires me. I think it is more the way that she approaches things and thinks outside of the box. I LOVE her seamless crochet book and the projects in there. I am always trying to take that logic and apply it to the other projects that I am working on. Thanks for a great review and a chance to win! Hi I’m Myrian from NYC, I admire her work. I think her Dragonfly Shawl is just beautiful. I would love to have this book. Rhiannon from IL – Love the Zen Garden Mobius and Blue Ridge Wrap! My book came yesterday. Beautiful photography and some stunning edgings. Thank you.